A cat has been rescued after getting her head stuck in a rat bait box in a Chelmsford supermarket. 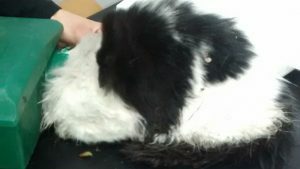 The RSPCA was called to the store at 11pm on Tuesday 6 March. Animal collection officer Anna Glozier took the cat to a local vet where they cut the plastic box from around her head. Anna Glozier said: “This poor cat had managed to get herself totally stuck in this box, however once we managed to release her from it she soon showed us she wasn’t happy about what had happened to her. “She was checked over by vets at Vets Now at Witham who were incredibly helpful and once given the all clear, I was then able to take her back to the location to release her. “She is feral and part of a feral colony we are aware of in the area. She certainly didn’t give me a second look as she ran off, but I am glad that this was a happy ending for her.